Iran is now concentrating upon the war in Syria, but from 2014-15 Iraq was its major focus. When the Islamic State swept through Ninewa, Salahaddin, and Kirkuk provinces in the summer of 2014, Tehran was the first to offer assistance to the Iraqi government. Military support was only part of Iran’s program however. It also launched a sophisticated propaganda campaign to promote itself as the savior of Iraq. This was carried out on social media mostly via Facebook, Twitter, and other platforms. 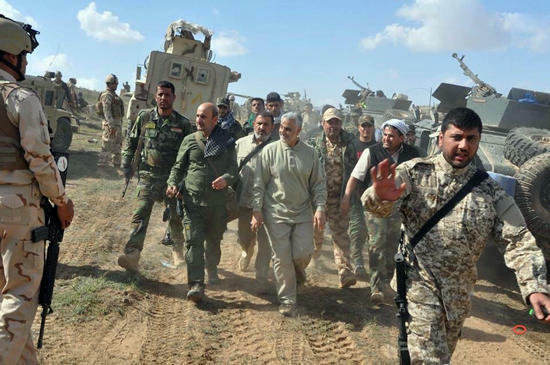 At the center of this effort was Iranian Revolutionary Guards Quds Force commander General Qasim Suleimani. He appeared on all the major battlefronts in Iraq again and again on the Internet. The success of this campaign was shown in a survey done of pilgrims to the Shiite shrine in Karbala. A group of three researchers working for the Massachusetts Institute of Technology interviewed 1,668 Iranians and 2,410 Iraqis during Arabaeen in Karbala in 2015. Those questioned overwhelmingly supported Iran’s policies in the Middle East. When asked what motivated Iran in the region the most popular response for Iraqis, 40.68%, was to protect Shiite communities. That compared to 27.33% of Iranians selecting that choice. That showed how effective Iran’s propaganda campaign was within Iraq. Iraqis felt like Tehran was helping them more than Iranians themselves. This was of course in the middle of the war with the Islamic State, Iraqis were still feeling vulnerable, and when Iran was pumping up its role in Iraq far above the U.S. led Coalition, which preferred having the Iraqis claim responsibility for their victories. Other factors shaping the response would be the negative view most of those interviewed had of America, as well as religious Shiites being more open to Iran’s role then others. In contrast, a plurality of Iranians, 39.28% believed that national security was the main driver of Tehran’s foreign policy. January 26 was the second day of the pause in operations between taking east Mosul and attacking the west. That didn’t mean the Iraqi Forces (ISF) were out of action. The 9th Division announced it took Shreikhan. This is a town north of the city, which was first declared freed on January 24. Inside the city the Federal Police were clearing areas of explosives. The ISF were also looking for potential suicide bombers. U.S. Colonel John Dorrian warned of Islamic State sleeper cells hiding amongst the population that could later carry out attacks. Just last week a suicide bomber was gunned down approaching a checkpoint. With so many people staying within Mosul there was no way to screen them, which means there are likely IS members still there. The civilian population has been providing intelligence to the ISF to hunt down these members, but they will remain a threat. There are not enough ISF available to secure the city while the combat forces move onto the other half of the city. That means the government has to call on others. A Shabak Hashd Brigade is within the city. So is ex-Ninewa Governor Atheel Nujafi’s Hashd al-Watani, also known as the Ninewa Guards. They fought alongside the 16th Division in northeast Mosul, and now have been given some areas of the city to hold. This is a boost for Nujafi is who attempting to rebuild his base. Retired General Alsodani Ismael wrote a piece on how the first half of the battle went down. The original plan was for the ISF to reach Mosul from the north, east, and south at the same time to spread out the Islamic State defenders. Instead the north and south stalled and the Golden Division reached the east very early on. Two of the army divisions in the north were brand new and had never seen combat before. Some of the commanders were unfit and inexperienced as well. He called for special operations raids, attacking on multiple fronts, and maneuvering in the next phase. The Golden Division were carrying out targeted attacks to eliminate IS commanders. The ISF is pushing a quick assault on the west, which probably involves a frontal assault across the Tigris. They could also move forces to the south and attack from there. The problems the Iraqi forces have in coordinating multiple fronts was exposed in the initial attack upon the city, and they may not have had time to improve. On the last point, the ISF was eventually able to attack across three broad fronts in east Mosul, which eventually connected together. Whether the units are up for a more dynamic plan is yet to be seen. Some Iraqi commanders have said the west Mosul fight will be completely different from the east. The fate of Tal Afar in the west is becoming clearer. Early on in the campaign the Hashd reached the town, which was then to be taken by the ISF. This was in part due to strenuous objections by Turkey claiming that the Hashd would commit abuses. Recently National Security Advisers Falah Fayad said the Hashd could enter Tal Afar. General Abdul Yarallah added to that by saying that the Hashd supported by the Iraqi Air Force would liberate the town. That change may be due to a lack of army and police forces to take it, while assaulting Mosul at the same time. This will be a huge victory for the Hashd. They have talked about protecting the Shiite Turkmen in the area. The Iranian linked units would also like a presence there because it is a gateway to Syria. That would allow Tehran to move men and material straight across from Iran through Iraq to Syria. If that happened it would be highly ironic. Tal Afar used to be the route Al Qaeda in Iraq and the Assad government ferried in foreign fighters into Iraq to destabilize the country. Now Iran wants to use it to prop up the Syrian regime. Over the last seven days the number of displaced (IDPs) in Ninewa has decreased, but it is still the highest amount since the Mosul campaign began. According to the International Organization for Migration, there were 159,252 IDPs registered with the government and aid groups on January 20. That went up to a high of 161,238 on January 23, but then after that went down each day to 159,006 on January 26. That compared to 116,292 displaced at the end of December. In 28 days there has been an increase in 42,714 IDPs. With the attack on the other half of Mosul coming up there will be another wave of people fleeing the fighting. Each day more people are going back to their homes, and the rebuilding has begun. Since October 16 roughly 28,980 people have returned, and that figure is going up. Bas News was in Tel Keif, which was recently liberated. Almost 3,000 people were back, shops were re-opening, and the city council wanted to start projects to restore power and water. In Mosul, the Ninewa council held a meeting with the mayor to assess damage to the city. It opened offices in three neighborhoods to try to restore services and governance. Parliament’s human rights committee called on Prime Minister Haider Abadi to start paying salaries again to people in the liberated areas. Students from Mosul University are pushing for the campus to be repaired and re-opened. Slowly but surely the populace and authorities are trying to get Mosul and the surrounding area back up and running. This appears to be happening much faster than in other cities. Finally, there were new casualty figures. Based upon reading over 40 papers a day and releases by aid agencies a total of 5,404 deaths have been counted and 16,983 wounded from October 17, 2016 to January 21, 2017. The vast majority of those are civilians with 4,741 killed and 14,842 injured. The Islamic State has been accused of executing 2,798 people. Coalition air strikes have been blamed for another 561 fatalities and 653 wounded. The fighting caused the rest. In the first three weeks of January the Mosul campaign was the main driver of violence and casualties in Iraq. From January 1-21 there were 488 incidents reported in the press. Of those, 236 were in Ninewa, or 48% of the total. Those incidents led to 1,398 deaths and 3,654 wounded. 950 of the fatalities, 67%, and 2,919 of the injured, 79%, were from the Battle for Mosul. Baghdad used to be the center of attacks in the country, but those have been cut in half since Mosul started. In September 2016 there were an average of 10.8 incidents per day, which dropped to 4.7 by December. That’s slightly up to 5.8 per day in the first twenty-one days of January. On January 5, a new, but short-lived campaign in west Anbar was launched. The stated goal was to liberate the last towns in the province along the Syrian border. Al Mada quickly pointed out that this was not all that it was cut out to be as Prime Minister Haider Abadi didn’t officially announce it. It also noted that the United States had opposed previous operations because it didn’t want to interfere with the Mosul campaign. In November for example, Baghdad wanted to push on western Anbar, but the Americans intervened. The campaign only lasted around two weeks. A tribal leader told Al Mada, that it would not restart until Mosul was freed. In total around 11 villages were taken, and the Islamic State did not put up much of a fight for them. While incidents have gone down in Baghdad, mass casualty bombings are up. When the government launched the Mosul operation in October, the Islamic State countered with a car bomb campaign in the capital. In September there were 2 successful vehicle borne improvised explosive devices (VBIEDs) in the capital with 2 more dismantled or destroyed. In October that went up to 4 bombings, then 7 in November, 9 in December, and then 13 so far in the first three weeks of January. A member of the Baghdad security committee accused the security forces of taking bribes from IS to allow their bombers through checkpoints. This has been true for years. This also coincided with the government deciding to take down concrete barriers and checkpoints in sections of the capital at the end of December. Baghdad Governor Ali al-Tamimi promised surveillance cameras and other forms of electronic security measures, but that has not materialized. Given the inability of checkpoints to stop previous bombings it’s unclear whether their removal really had any effect. IS has also changed its tactics. It is reportedly moving from the residential areas to the suburbs and moving assets around to try to prevent them from being discovered. Diyala is one of the provinces where IS is re-organizing and ramping up its operations. From January 1-21 there have been 33 incidents for an average of 1.5 per day. In October 2016 there were 1.4 incidents per day, but that went down to 0.9 in November and 0.8 in December. These have included temporary seizing of towns, attacks on checkpoints, suicide bombings, and car bombs. Before most of the attacks were small shootings and IEDs with regular mass casualty bombings. Now Diyala is seeing large numbers of IS fighters in bigger operations. A Diyala parliamentarian from the Supreme Council called on the prime minister to open an investigation into the security failures, and blamed commanders for negligence. Badr head Hadi Ameri is in charge of security in the province with the Iraqi forces in a support role to his Hashd units. In Kirkuk the Islamic State has one of its last strongholds in Hawija. The provincial government is increasingly calling on Abadi to free the area, but with Mosul going on that’s not going to happen right now. Hawija is turning out to be a major source of instability not only in Kirkuk but neighboring governorates as well. Cells from Hawija have been blamed for carrying out attacks in Salahaddin for example. There are constant reports of executions within the district, and displaced people being killed trying to escape. Along with Diyala, Salahaddin is the other province seeing an uptick in insurgent activity. In the first three weeks of January there was an average of 1.6 incidents per day, the highest amount since June 2016 when there were 1.7. Just like in Diyala IS has moved from small hit and run and IED incidents to larger, more organized operations. On January 2, 9 suicide bombers attacked Samarra and were able to seize two police stations before being expelled and killed. Members of the provincial council have talked about IS cells operating in various areas. Also like Diyala, most of the security duties in Salahaddin are under the control of the Hashd. This has caused problems. The head of the Salahaddin council for example talked about too many different security forces in Samarra with overlapping duties and a lack of cooperation that has led to gaps, which have been exploited by the Islamic State.